The new Mammut Barryvox digital three-antenna avalanche beacon reduced to the essential functions. The Mammut Barryvox® scores well on simple navigation and clear instructions. With a large receiving bandwidth and an effective search strip width of 70 meters, it offers users a simple interface and intuitive operation. From an easy-to-read display to buttons that can be operated even wearing gloves, shock-proof and break-proof housing and a revolutionarily simple visual interface, the Barryvox® shows that powerful performance and sophisticated search guidance do not need to be complicated. 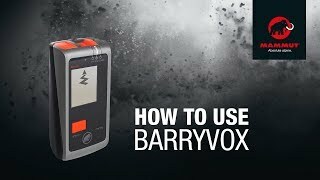 The Barryvox S has dynamic screen icons to walk you through the search – the icons move and change through your search process, indicating if you should be running, walking or crawling. The Barryvox S has something called Smart Search, which operates in the background – it makes for a smoother search process. The Barryvox S has something called Auto Guidance, which also operates in the background – it provides uninterrupted search direction, even when there’s multiple signals competing for your attention. No more “stop and stand still,” just go, go, go.